Hello and welcome to this month’s Stitching Focus! 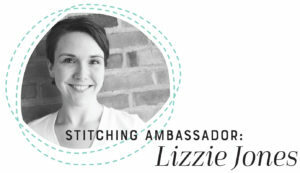 I’m Lizzie Jones, your Stitching Ambassador and I am so excited to be here sharing with you today! 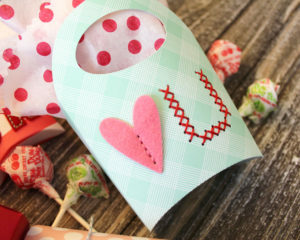 Rather than showcasing one particular product this month, I thought it might be fun to share a few different ways that you can incorporate stitching into your Valentine treat packages. We all like to present holiday treats with a bit of pomp and flair, but we don’t always have time to stitch together an entire bag. In those cases it can be just as satisfying to use our stitching dies to give cardstock boxes and bags a touch of hand stitched texture. I have four different packages to share with you today that incorporate stitched details for that homespun feel. Let’s start today with the Popcorn Bucket. I used the Stitched Monogram Frame: Square to highlight a Sweet Blush felt heart. 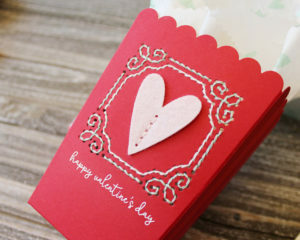 This heart is part of the From The Heart Die which isn’t designed to have stitching holes, so I used one of the Stitching Lines to attach it to the box. Alternatively, you could easily just adhere the felt heart to the bucket and save yourself a step. Either way, you get the texture of the felt and stitches contrasting against that smooth cardstock. I heat embossed the greeting from the XO Skinny Mini set below the frame and used the Boxed Background Stripes to stamp tone-on-tone stripes on the other three sides of the box. 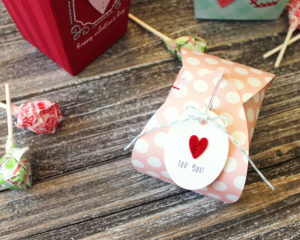 I also stamped custom heart tissue using one of the small hearts from From The Heart to round out the package. 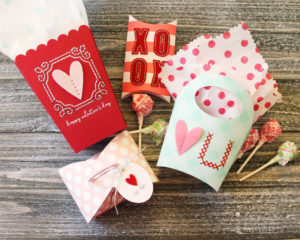 The mix of stamping and stitching gives this treat package multimedia flair that I adore. 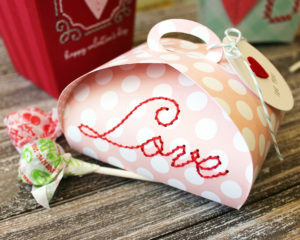 Next up, I’ve paired the Essential Pillow Box with the Valentine Stitches Die Collection. The bold stripes of the patterned paper are strong enough to stand up to those block letters. The “X” and “O” actually even look great on the box being simply stitched (without a felt layer), especially on solid cardstock. But on these, the felt adds lovely texture to this box and the contrasting stitches pop nicely against the bright Pure Poppy color. 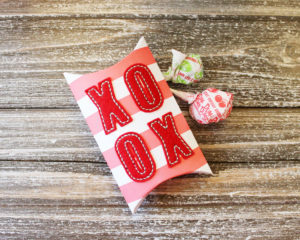 Alternatively, you could use a monogram or a simple heart stitched onto one of these pillow boxes for a quick and easy treat box with a handmade vibe. My third package today is a mini tote made with the Fry Box and decorated with a felt heart and the Cross Stitch Alphabet. I began by die cutting the Fry Box twice from Bitty Big: Aqua Mist patterned paper and then used an oval die (this one is actually the oval tag in the Carrot Box Die Collection) to cut out the handles. Any oval will do, so take a peek through your collection to see what you have handy. Once again, I used the Stitching Lines to attach the Berry Sorbet heart to the box, but you could always simply adhere the felt to get the same effect a little more quickly. I die cut in the “U” and stitched with bright red floss for a bold contrast against the Aqua Mist base. I used a polka dot (this one is from Corner Adorner: November) to stamp coordinating tissue. 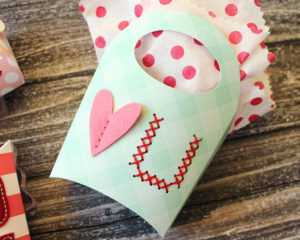 This little tote is my favorite way to use the Fry Box and it looks even more charming with the stitched details. 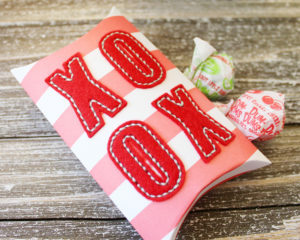 Again, you could easily substitute this cheeky Valentine message with a monogram for year-round gift giving. My last box today is a petal box with a beautiful Quick Stitch Sentiment and sweet little coordinating tag. These came together in a snap thanks to a patterned paper base and easy-does-it script. The greeting takes on a fun, joyful air thanks to the big, playful polka dots on the Bitty Big: Sweet Blush paper. The little tag truly couldn’t be easier. 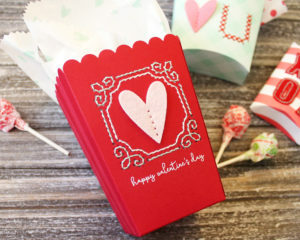 I stamped a message from the From The Heart mini set and added the tiny heart from the Valentine Stitches Die Collection before tying it on to the box with baker’s twine. It’s truly simple, but the texture of the felt and stitches makes the whole package feel like something special. So there you have it, four different packages that show just how easy it is to add stitched details to your Valentine treat packages. I hope you’ve enjoyed your time with me this month! Maybe this post has given you a few ideas for giving your own upcoming holiday treats. Have fun! I'm a freelance graphic designer that never stopped loving to color. I spend my days building a little house of cards with my favorite fella by my side. I also design stamps for Papertrey Ink. These projects are wonderful, Lizzie! So many variations in packaging and very cute. Love the stitching on packaging! Lovely packaging, especially the popcorn bucket.